How do I install MATE (the desktop environment)? I have seen several youtube videos that are showing MATE (The Gnome 2.x fork) installed in 11.10. How can I install it to test it out in 11.10 and above. If you want MATE without the minty-freshness (sic) you could use the debian repo specifically for Ubuntu. This repository contains 300Mb of pure Mate-desktop packages - that is, the Gnome-2 packages after the fork together with fixes released since. Examining the package list, there doesn't appear to be much/if any updates to the base Ubuntu package lists. What this means is that - unlike the Linux Mint derivative - the Mate-Desktop in this repo will sit much more comfortably along side any other desktops installed on Ubuntu - for example, Gnome-Shell, Unity, LXDE etc.. The Linux Mint Mate repo contains Mint specific changes but more importantly, later versions of the Gnome-3 packages that will upgrade Unity & Gnome-Shell packages - it is a more one way install. Open a terminal complete the following steps to enable the appropriate PPAs and install MATE 1.8.1 on Ubuntu Trusty. Then update and install. You will get a complaint about a missing (gpg) key, which we will fix. I would consider disabling the mint repo after installing MATE, and would install as few packages as possible from mint (to avoid any conflicts). Note: Do this at your own risk, it is possible the mint repo will cause problems, and I would not do something silly like sudo apt-get dist-upgrade with the mint repo activated. You might want to make or wait for a ppa. yes, it is. check the link provided by Martin. sudo add-apt-repository -y "deb http://packages.mate-desktop.org/repo/ubuntu precise main"
sudo add-apt-repository -y "deb http://repo.mate-desktop.org/ubuntu precise main"
sudo add-apt-repository -y "deb http://packages.mate-desktop.org/repo/ubuntu quantal main"
sudo add-apt-repository -y "deb http://repo.mate-desktop.org/ubuntu quantal main"
Is this gonna install the exact same DE that LinuxMint uses? Or slightly different...more Ubuntu style-like Mate? ? It's not bundled with the distro as of 12.04, but you can dowload and install it. First of all, install MGSE (Mint Gnome Shell Extension) in Ubuntu 11.10 by entering this command in Terminal. This will pop-up a gedit window, where you will require adding the following line at the end (as exactly shown). Once done, enter these commands in Terminal. After following the procedure described above, MGSE and MATE will become available in Ubuntu Software Center. 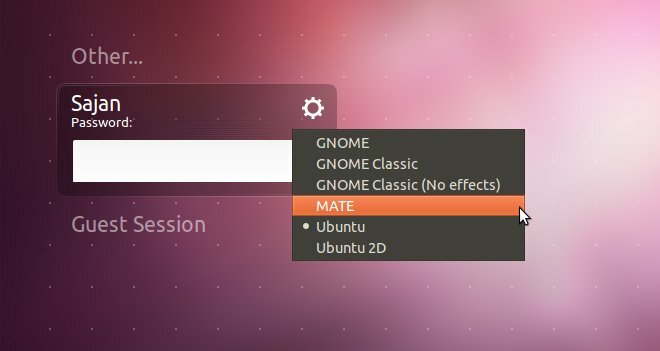 Now, search and install Mint Gnome Shell Extension, followed by Mint Meta Mate from the Ubuntu Software Center. Not the answer you're looking for? Browse other questions tagged software-installation desktop-environments mate or ask your own question. Is “Mate” an available desktop environment on Ubuntu 12.10 and 12.04 and attractive as on the LinuxMint 14? How to revert to GNOME Classic Desktop? Is running Cinnamon on Lubuntu a good idea? Ubuntu - Install Mate Desktop - Themes missing? How heavy is Mate desktop environment?